Its enormously tall flower clusters - towering up to 65 inches (175 cm.) above the ground - make it one of the most spectacular bulbous plants in the entire assortment. The name of this genus comes from 'ekemos' meaning 'solitary' and 'oura' meaning 'tall'. All of the several dozen species originated in Asia. Unfortunately, the Eremurus is little used in gardens. Its tuberous roots have a very strange shape; thick fleshy roots fan out in all directions from a central hub. These roots must be handled very carefully. The soil should be well-drained, so add sufficient sand to heavy clay soils. 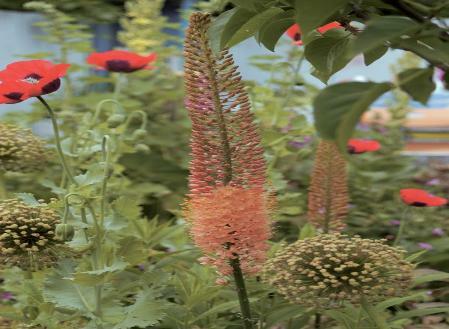 Eremurus is often grown as a cutting flower by professional flower producers. In regions with hard frosts and where it stays cold long into the spring, these plants should be placed in a sheltered location. Although the tubers themselves are winter hardy, a mulch layer is highly recommended. Sometimes, a basket covered with straw is placed over the young shoots if they emerge very early in the spring. Once the plants have remained in the same location for some years, they can develop into quite a healthy clump. Long, sturdy, round flower stems develop from the leaf rosette starting in May. The slender flower clusters are richly covered with white, yellow, pink or orange blossoms. Since the leaves of the plant wither back during the flowering period, make sure that the tuberous rootstocks are planted among ground covers that will provide added attractiveness.